It is $75 per jump(rates may change during seasons), including a bus ride to the site, lunch and a free T-shirt. Nepalis are entitled to 30% discount. 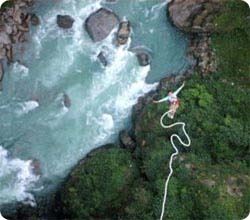 Other than the jump, there are options like white water rafting down the ranging Bhote Kosi, rappelling down the canyon, or trekking in the nearby mountains. You can also get there in a local bus or hire a private minibus. If you want to check out a place to stay, Barabise is good enough, but has of late frown into a noisy little town. It is advisable to stay at the resort close to the Tibet border, if you can afford it. Drive to Last Resort. Briefing and preparing for Bungy and after the jump, rest and overnight at Last Resort or drive back to Kathmandu. • Transport to and from Kathmandu. Note: Bungy jumping is not recommended for the people suffering from heart attack and who are afraid of heights.